Entering the draft with two first-round picks, it was seemingly always a matter of when the Buffalo Bills were going to move up to draft a quarterback, not if. They did just that when they moved up to No. 7 overall to draft former Wyoming quarterback Josh Allen, who despite a cannon for an arm, has questionable accuracy. Allen finished the last two seasons ranked among the worst in the nation at negatively-graded throws and threw the 29th-most turnover-worthy throws in the draft class (out of 38 quarterbacks). Buffalo acquired AJ McCarron this offseason from the Cincinnati Bengals and second-year quarterback Nathan Peterman is also on roster, but unlike the situation with Josh Rosen in Arizona, neither quarterback on roster is an established signal-caller. Aside from what looks to be a quarterback battle through training camp with their selection of Allen, the Bills selected Tremaine Edmunds in the first round with their 16th overall pick. Edmunds is a strong athlete yet still raw at his position as he was just 19 years old at the time of the draft. He finished with the ninth-ranked run-stop percentage among draft class linebackers and also held a solid coverage grade showing his versatility in both phases. 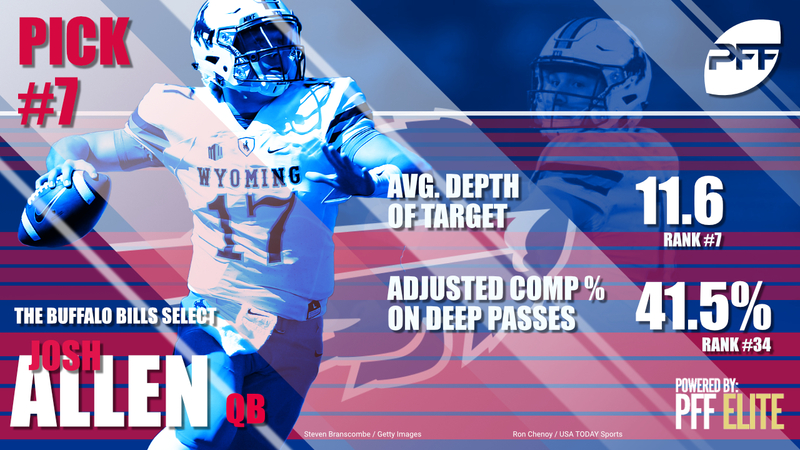 Behind their first-rounders, the Bills were able to nap some of PFF’s leaders in certain signature stats, including Harrison Phillips who led the nation’s interior defenders a season ago with his run-stop percentage and run-defense grade. He didn’t show much as a pass-rusher but his run-stuffing potential will keep him on the field in short-yardage and obvious run downs at least to start. Wyatt Teller finished each of his years at Virginia Tech with grades between 86.0 and 89.3 and provides great value in the fifth-round while lesser knowns in the secondary were also grabbed on Day 3. Taron Johnson of Weber State and Siran Neal of Jacksonville State each hail from lower level schools and performed admirably at either the Senior Bowl or during individual workouts. Capping their draft in the sixth and seventh round, respectively, the Bills added to their receiving corps with the picks of Ray-Ray McCloud and Austin Proehl. McCloud led the draft class by hauling in 50 receptions without a drop and Proehl had an up-and-down career at UNC but may add value on special teams immediately.